This page describes ongoing pilot field studies of soniferous fishes in various localities, including New Jersey, Cape Cod, Massachusetts, Narragansett Sound, RI, and Florida (see also, links under Stellwagen Bank study). I also include some information on my efforts to record Atlantic cod and haddock sounds from brood stocks maintained by the NMFS/NEFSC Narragansett Laboratory. I. Soniferous fishes of Cape Cod. This project is currently underway. One of the early findings is that striped cusk-eels, Ophidion marginatum, are very abundant in Cape Cod estuaries and coastal waters (see cusk-eel page). As part of this project, I have been monitoring fish sounds in a variety of habitats around Cape Cod from June 2001 and continuing through the fall. I will be adding many new clips from this study in the coming months. A. This project was funded by a development grants from The Sounds Conservancy and the Woods Hole Sea Grant Program. A copy of the mini-grant proposal can be viewed by clicking here: Proposal. B. The following are some recordings I made during the late summer and fall 2000 during early sampling trials. 2). (Click on thumbnail to download clip). Video of scup, Stenotomus chrysops, black sea bass, Centropristis striata, and a large tautog, Tautoga onitis, taken shortly after the above searobin clip on September 30, 2000. In the first few seconds you will see a scup pulling bait from a chum can. You can also hear it tear the bait out and chew on it. The load splash you hear is my fishing line hitting the water (You can easily hear fishing lines hit the water from several hundred feet away. Even in very noisy conditions.) Next you will see two small black sea bass feeding on scrapes left by the scup. One of the black sea bass leaves while one stays behind trying to get more food from the can (he is on the bottom near the left end of the chum can). The second sea bass darts away rapidly when disturbed by an unknown sound. Did you spot the tautog yet? Believe it or not, a large tautog is in the field of view during the entire clip! He is siting on the left side of the screen facing the chum can. His head is larger than the height of the can (4-5 inches). You can see him move away in response to the unknown sound at the same time as the black sea bass. I had seen this clip six or seven times before I noticed it, even then I thought it was a fish "ghost". I'm using a camera equipped with IR lights so the camera does not disturb the fish. Under these conditions, the tautog is extremely well camouflaged! 1). Poster presented 14 August 2001 at the Waquoit Bay National Estuarine Research Reserve on Cape Cod describing sounds of some of the vocal fishes in the area. 2). 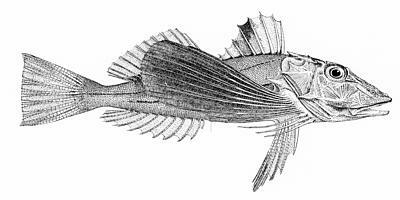 Spontaneous sounds of the striped searobin, Prionotus evolans from Cotuit docks. B. Recordings of the gulf toadfish, Opsanus beta, recorded as above. Below is an illustration of the nearly identical northern Oyster toadfish, Opsanus tau (see the archive section for recordings of O. tau, I will add in my own at a later date. ).